This frameless 3M™ privacy filter helps reduce reflection and glare from the screen. 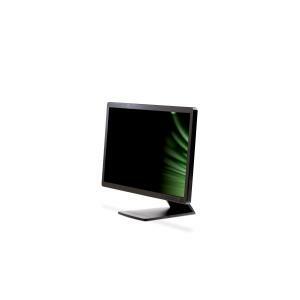 It is reversible and fits all 22 Inch widescreen desktop LCD monitors with 16:10 aspect ratio. The MicroLouver technology keeps the confidential data from prying eyes by limiting the viewing angle. It is easy to clean and protects the screen from dirt and scratches. These days, it's easier than ever to view your private information in public. Coffee shops, airplanes, subways, buses, and even malls are common places hop on the internet, check your email, and access your work or personal files. But no matter where you choose to go, protecting your privacy is essential. 3M™ Privacy Filters help block curious eyes from stealing sideways glances at your screen – whether you're using a monitor, laptop, tablet or smartphone. So wherever you go, you can keep your business your business. Anyone viewing your screen from a side angle will see a gold, blank screen while you still see a clear image. 3M Privacy Products also protects your screen from scratches and scuffs and can be easily removed and repositioned. 3M™ Privacy Filters use an advanced technology that simulates tiny Venetian blinds shielding your screen from curious glances. The result? You get a straight-on, clear view of your information, while the people on all sides of you see a golden screen. Only 3M™ Privacy Filters give you all the benefits of 3M technology. Our innovation, superior quality and durability are second to none. But these are just a few of the many reasons to trust your privacy to 3M. Remove mounting tabs and bend to separate. Peel liner from tabs and place as shown (use as many tabs as you prefer). Slide the filter onto your screen, between the tabs…and you're done!